In less than two weeks since ABC Action News first reported that three people have been hit at a crosswalk near Barrington Middle School, the county is promising changes on the road. 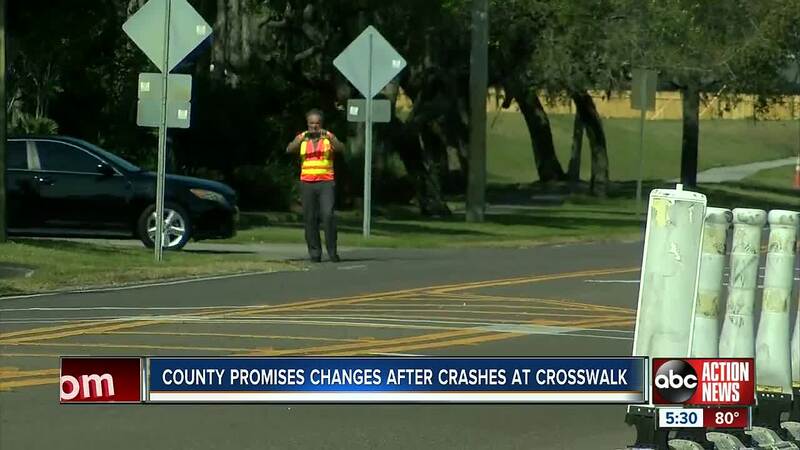 HILLSBOROUGH COUNTY, Fla. -- In less than two weeks since ABC Action News first reported that three people have been hit at a crosswalk near Barrington Middle School, the county is promising changes on the road. A spokesperson for the county tells ABC Action News that along with their immediate fix to make the crosswalk safer for pedestrians, majority of them children, they will also add a sidewalk. The Public Works department said a portion of Boyette Creek Road will eventually get sidewalks. The county said they are already in the design phase to add a sidewalk from Boyette Creek Boulevard to the Barrington Stowers intersection. They say along with the design phase, this will include land acquisition and permitting. Both of which take time. The project will likely take up two years. Parents spoke with ABC Action News to voice their concerns about their kids crossing the dangerous crosswalk. They cross Boyette Road again, because the school is on the original side of the road they started from. "They're put in danger not once but twice," said Nick Provanzana. Alice Armstrong rides a bicycle along Boyette Road and said she fears for children at the crosswalk. "This crossing we thought was going to be a good thing," she said. "But people don't even slow down, I don't think they know what to do." ABC Action News reported in February that three people have been hit in the crosswalk in one year. However, the ages of all of the victims is unclear. We did find out from the Hillsborough County Sheriff's Office that the people hit were between 8:30 a.m. and 8:55 a.m., which is when kids are on their way to Barrington Middle School. The latest person hit was a 12-year-old student. They're expected to survive. The crosswalk was installed back in August 2017 after parents raised red flags. They were concerned that students were having to play a game of Frogger to cross Boyette Road, which has no sidewalks. Along with a sidewalk that is a few years down the road, the county is making immediate changes. The county has trimmed back some of the bushes, but we still watched drivers passing in the crosswalk for pedestrians. Half a dozen public works employees had an on site meeting this week to review their plans on making the intersection safer. Along with safety updates, the Hillsborough County Sheriff's Office has also been pulling over drivers who are not stopping for pedestrians in the crosswalk. Many of those drivers pulled over though told deputies they could not see a person standing there. "Given the location, environmental considerations, and the volume of pedestrians, the County is moving forward with a project to install a pedestrian signal at this locations. The signals will be placed over the road lanes with back-plates with reflective edges surrounding the signals to increase their visibility during sunrise and sunset and during dark time periods. A timeline for installation of the signal is currently being developed. The trees near the crosswalk will be trimmed to lessen any visibility limitations from shadows near and at the crosswalk." For the remainder of the school year, parent volunteers will be at the crosswalk to help students safely cross.